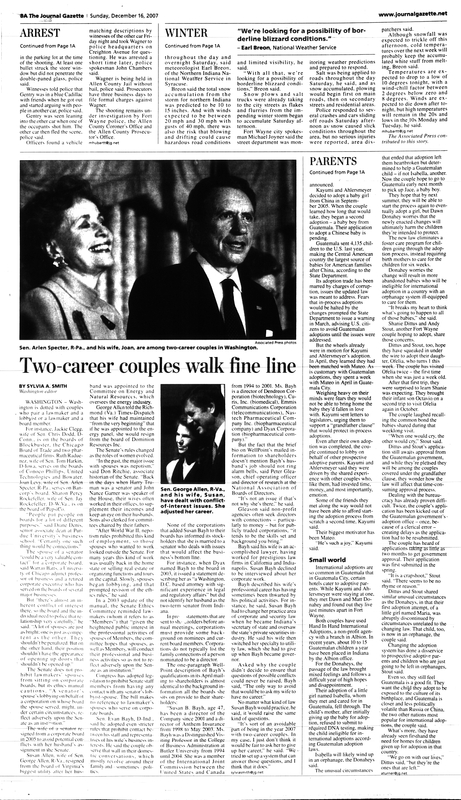 "The intersection of the Bayh's professional lives illustrates the touchy ethical situation some couples face when one spouse is employed by the taxpayers to watch out for their interests and the other is dutybound to work for the financial interests of only a small group of people - the shareholders of the companies Susan Bayh directs." 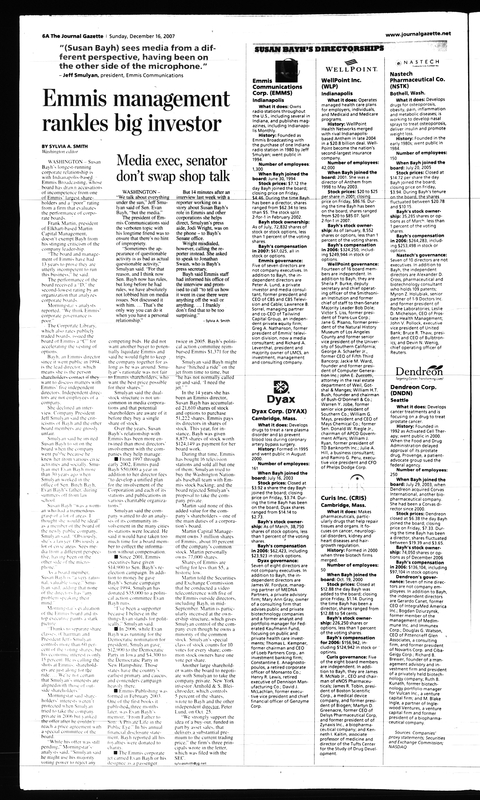 That was written by (Fort Wayne) Journal Gazette Washington Bureau Chief Sylvia Smith in December of 2007. In a clutch of stories, Ms. Smith, outlined the board memberships of the wife of Indiana's junior senator and the compensation paid in both director salary and the exercise of stock options. 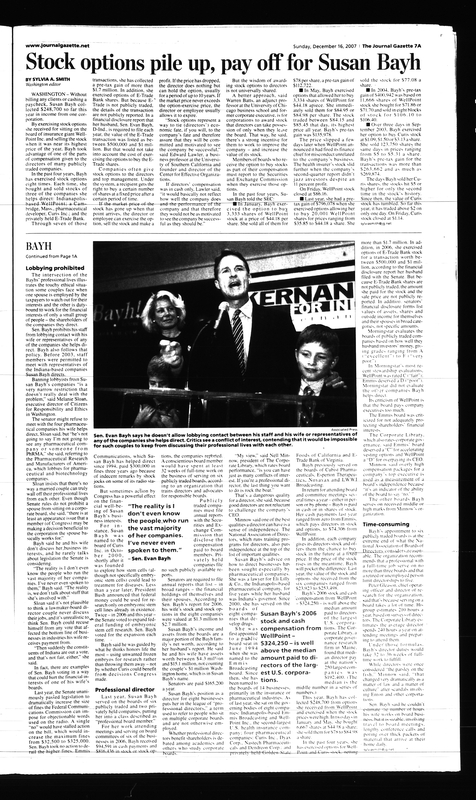 The article has not been available online and there is no link provided on the Journal Gazette website to its own stories that might help inform voters as Mr. Bayh's post-Senate lobbying career and job search activity during his last year in the US Senate have become a focus in the 2016 election. Fort Wayne Observed is making those articles available for download here as a pdf. Additionally, photocopies of the story are also available in jpg format: Front Page V6A 7A 8A . 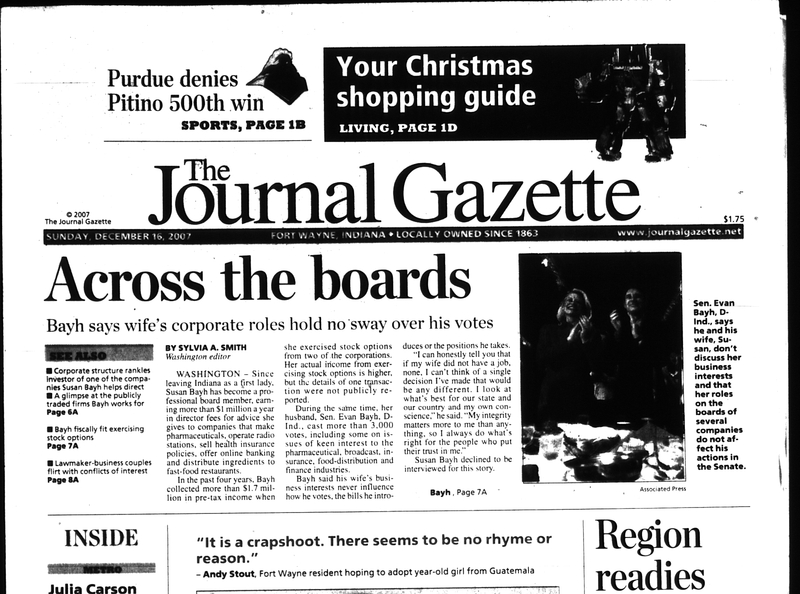 These copies were made of microfilmed copies of the Sunday, December 16, 2007 edition of the Fort Wayne Journal Gazette. Ms. Smith has retired from the Journal Gazette and the newspaper has not maintained a reporter in Washington, D.C. since her retirement. The weekend these stories were published Ms. Smith was elected as the 101st President of the National Press Club. "Last year, Susan Bayh served on the boards of six publicly traded and two privately held companies, putting her into a class described as "professional board member. For her work attending meetings and serving on board committees, of six of the businesses in 2006, Bayh received $94,591 in cash payments and $816,436 in stock or stock options," the companies reported." Susan Bayh was Indiana’s first lady from January 1989 until January 1997. Since then she has raked in millions of dollars in cash, stock and options as a professional board member for pharmaceutical, communications, insurance and other companies. With husband Evan Bayh now representing Indiana in the U.S. Senate, critics of this boardroom-Capitol Hill couple see an inevitable conflict of interest – that Susan Bayh’s business interests will affect her husband’s actions in Washington. The senator insists that is not the case. Ms.Smith had just been elected two days before the publication as the 101st President of the venerable Washington Press Club. The Journal Gazette does not have a current link to the December 16th story on its website. Presumably, the JG editorial board didn't consult its own archives when deciding endorsements in the 2016 US Senate race.